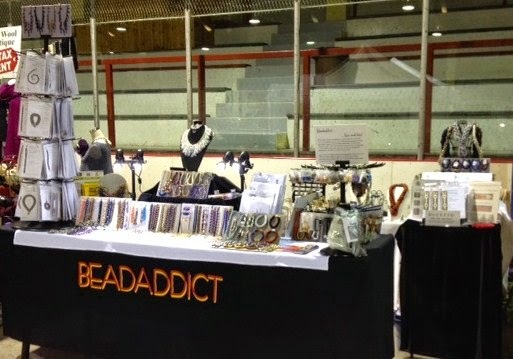 Here is Beadaddict/Ducette Lady at the Almonte Fibre Show a few weeks ago. It was a great opportunity to feature the ducette kits, scarves and jewellery to show everyone what a versatile tool the dual lucet can be. The latest tutorials for the "FLARE" style of braiding as well as the T shirt mat were available for sale too. The beaded jewellery kits, especially those with crochet were popular too. Next year I hope to include "Festival Twist" in Quebec on the list of shows to visit as it is also open to fibre vendors of all types. Know of a fibre show in your area? Drop me a line and tell me about it. OR if you were in Almonte and have something to show me from your experience with lucet braiding, please send me a picture!